If you’re suffering from acne, you perhaps know that finding skincare products that won’t trigger acne breakouts can be a challenging task. To prevent acne breakouts, you need to be extra cautious in choosing face wash, moisturizer, creams and other skin care products like sunscreen. Probably you must have already tried many sunscreens and after being dissatisfied, you are now searching for a sun-blocker that helps control your acne. The problem is that conventional sunscreens aren’t designed to suit acne prone skin, so they either feel too heavy on your skin, or aggravate your existing acne. Read on here for a complete guide & useful tips about total protection of your skin from harmful UVA and UVB sun rays, how to select the best sunscreen for acne prone skin, and an ultimate list of dermatologists chosen top sun screens for acne prone skin in 2018 with their reviews. How to Choose the Best Sunscreen for Acne-Prone Skin? You’ve perhaps heard that certain acne medications can make your skin more susceptible to sunburns. Also acne-prone skin is almost always accompanied by oily skin. Because of these two reasons, an acne prone skin needs a different approach for protecting it from the sun. Therefore if you use just any sunscreen on your face, you’d add extra shine and grease to your skin and that will trigger severe acne breakout. If you have oily skin, we recommend that you choose a sunscreen that contains titanium dioxide and zinc oxide. Both of these ingredients help treat acne on oily skin. Now let us discuss the most important element in a sunscreen, that is SPF. What is SPF And Why SPF Matters? The sun protection factor, or SPF, of sunscreen is an indicator that informs how long you can stay in the sun than normal without burning your skin. Applying sunscreen with an SPF of 10, for example, means that it will take 10 times longer for your skin to begin to burn than it would without sunscreen. So if your skin can tolerate 10 minutes in the sun without a burn, an SPF of 50 will provide 50 times that length of time, or 500 minutes of protection without burning. Both UVA and UVB rays lead to skin damage. UVA rays are the main cause of skin aging and wrinkling, while UVB rays cause burning. Both contribute to the development of skin cancer. For the best protection, use a sunscreen with broad-spectrum UVA and UVB protection. It’s cloudy outside – why do I need sunscreen? Note: UVA rays are present throughout the year and can penetrate glass and clouds. They account for up to 95 percent of UV rays on the Earth’s surface. UVB rays vary by season, location, and time of day and are strongest between 10 a.m. and 4 p.m. Useful Tip – What You Should Look For On Sunscreen Labels? (i) Broad spectrum: provides protection against both UVA and UVB rays. (iii) Photostable: describes UV protection that won’t break down when exposed to strong UV rays; sunscreens that include Helioplex and Purescreen technologies provide long-lasting, photostable protection. Now a very useful tip about which ingredients you should avoid when looking for a sunscreen for acne-prone skin. Make sure to avoid products that contain any of the following ingredients: benzophenones, aminobenzoic, methoxycinnamate, avobenzone, and oxybenzone. These five ingredients have tendency to worsen existing acne and cause more blemishes and breakouts. Don’t You Need Sunlight For Vitamin D And Well Being? Yes you need UV rays from the sun to make your body produce vitamin D. Actually the benefits of sun exposure are in fact well beyond just vitamin D production. But it’s important to make sure not to prolong the sun exposure and avoid getting sunburn. But practically, there is no way to know when you’re getting just enough sun exposure and when you’re exceeding the limits. That’s why the use of an effective sunscreen comes into play. It allows us to take advantage of the sunlight while warding off the harmful UVA and UVB rays. Lastly why was there a need to spend weeks in making this list of the best sunscreens for acne prone skin? Why did not I select only 5 or 6, but bothered to search for such a long list of best ‘acne sunscreens’? Because all sun-blocks are not the same, and I had to analyze and select only non-oily, non-comedogenic formulations for acne prone skin. EltaMD UV Clear SPF46 1.7 is made using niacinamide (vitamin B3), hyaluronic acid and lactic acid, ingredients that promote healthy-looking skin. This non-greasy, ultra lightweight, silky and oil-free formula sunscreen is designed to protect even a sensitive skin against the harmful UVA and UVB rays from the sun. Due to it’s mild formation, it helps calm and protect sensitive skin types that are prone to breakout, rosacea and hyperpigmentation (discoloration). (i) It can be easily applied and absorbed into the skin. Calms and protects acne-prone skin. This sunblock can be used for both your face and body. (ii) In addition to UVA (aging) /UVB (burning) sun protection, it provides antioxidant protection to fight skin-aging free radicals plus also guards against infrared radiation (IR). (iii) It’s so lightweight that you can wear it with makeup or alone. (iv) Options available; tented and un-tinted for daily use. (v) Uses 9.0% transparent zinc oxide so leaves no residue. (vi) Noncomedogenic – meaning it will not clog pores. (vii) Fragrance-free, oil-free, paraben-free, sensitivity-free. (i) Some users complain that this sunscreen leaves a white cast on the skin. (ii) Some users aren’t happy about it not being resistant to water and sweat, which means you’ll have to reapply it regularly. Active ingredient: Zinc Oxide (9.0%) and Octinoxate (7.5%). Also contains pure form Niacin Amide (5%). (i) Shake the bottle before use. (ii) Apply 20 minutes prior to going outdoors. Specially formulated to provide ultimate sun protection without causing breakouts on acne prone skin. Uniquely designed using clinically-proven Neutrogena Helioplex Technology, the latest state of the art stabilized sunscreen technology, which provides high caliber broad spectrum UV protection from both skin-aging UVA rays and skin burning UVB rays sun exposure. Comes from the #1 dermatologist-recommended suncare brand. The liquid-lotion has a water-light texture that leaves a weightless, matte finish so skin can breathe. This dermatologist-tested formula is fragrance free and non-comedogenic, so it won’t clog pores or cause breakouts. It is water-resistant – 80 minutes. (i) Designed specially for acne-prone skin. Ultra-light and non-oily. Means it is suitable for wearing on a day-to-day basis. (ii) SPF 55 provides highest level of broad-spectrum UVA/UVB sun protection, leaving your skin healthy, clean and non-greasy. (vi) Perfect for face and body, this liquid-lotion leaves a weightless, matte finish so your skin can breathe. Suitable for: Acne sufferers with oily skin. Active Ingredient: Many, including avobenzone 2.7%, homosalate 4%, octisalate 4.5%, octocrylene 6%, oxybenzone 4.5%. (i) Like any specialized sunscreen it’s not intended as a standalone treatment for acne. You will need to use this in combination with other acne products to get rid of acne. (ii) It can sting badly if it runs in your eyes while sweating. Apply generously 15 minutes before sun exposure. Reapply after 80 minutes of swimming or sweating, immediately after towel drying, and at least every 2 hours. Some people say, one application should work for the whole day if you don’t cleanse it off. Uniquely designed using naturally sourced mineral sunscreen actives and zinc oxide that provide broad-spectrum UVA and UVB rays protection. Does not contain any chemical, yet effective as chemical sunscreens. Recommended by the Skin Cancer Foundation. (ii) Contains naturally sourced ingredients; the pediatrician-tested lotion does not contain any oxybenzones or parabens. (iii) Has been proven to last in the sun without breaking down and it’s very sweat resistant and water resistant for up to 80 minutes. (iv) A gentle skincare product, tear-free and sting-free formula so it won’t irritate even your baby’s eyes. (v) Easily absorbed into the skin. It also doesn’t appear heavy on acne-prone skin. Doesn’t leave any burning sensation. (vi) This sunscreen has been built for ’sport use’. Even intense sweating will not ruin the effectiveness of the lotion. Small bottle makes it simple to carry around. (i) Some users complain that this sunscreen leaves a white residue after application. (iii) Make sure you’re not sensitive towards Methylisothiazolinone, an ingredient in this sunscreen, or you’ll be inviting some unwanted side effects. Suitable for: Non-oily. This makes it suitable for people who have excessively oily skin, although any body can use it. This is perfect for those suffering from acne. Easy to use. Just apply 15-20 minutes before going outside. A pioneer in UV protection research for over 15 years, La Roche-Posay Face sunscreen with broad spectrum SPF 60 is trusted by dermatologists worldwide for its advanced formulations in UV protection. Designed with using Cell-Ox Shield technology with antioxidants, this unique Sunblock has ultra-light texture and is fast absorbing. Matte finish sunscreen. Suitable for sensitive skin. (i) A synergistic, optimized combination of UVA/UVB filtering system to provide broad-spectrum protection. Visibly reduces appearance of sun damage. (ii) Uses Cell-OX Shield XL technology, A powerful Antioxidant complex to defend against free radicals caused by UV rays. (iii) Decreases the risk of skin cancer and early skin aging when used as directed with other sun protection measurements. (iv) Ultra-light, fast absorbing texture provides a matte finish. Suitable to use under makeup. Water resistant (80 minutes). Tested on sensitive skin. (v) Has been rigorously tested and formulated for optimal skin tolerance. Dermatologist and allergy tested – it has also been tested on sensitive skin. (vi) It is fragrance-free and paraben-free. (vii) Non-Comedogenic, won’t clog pores. (i) Some users complain about this product’s rather strong odor. (ii) To get the most benefit, you have to reapply once every 2 hours. Suitable for: All skin types, including sensitive (even rosacea prone) skin. Shake well before use. Apply 15 minutes before sun exposure. Reapply every 2 hours after swimming or sweating. MDSolarSciences Mineral Tinted Crème Broad Spectrum SPF 30,1.7 oz. A natural, light tint broad-spectrum mineral sunscreen that blends with most skin tones and leaves a matte finish, so works as a perfect makeup primer. Naturally derived and safer mineral UV (SPF 30 UVA-UVB or 50) protection helps reduce the risk of photoaging and skin cancer. Also provides antioxidant protection. Contains green tea, cranberry fruit and pomegranate extracts and vitamin C. Long lasting, water-resistant up to 80 minutes and won’t clog pores. With its hypoallergenic coverage, this sunblock gives your skin a powder-like finish. (i) It is designed especially for those with acne and rosacea prone skin. Does a great job at healing your acne. (ii) Naturally derived and safer Eco-cert zinc oxide helps reduce the risk of photo aging and skin cancer. Protects your skin from the sun’s UV rays, soothes your blemishes, and conceals red spots. Recommended by Skin Cancer Foundation. (ii) Rich in antioxidants: Contains vitamin C, green tea, cranberry fruit and pomegranate extracts. This helps to protect the skin from bouts of acne, as well as provide quick healing for the skin. (iv) Gentle enough for the most sensitive skin types. (v) Absorbs quickly into the skin. Provides lightweight matte finish, which makes this exceptional formula to wear alone or as a primer for makeup. (i) Some users complain that this sunscreen feels oily to the touch when it’s first applied. (ii) Some complain it has allergic reactions. So, make sure you’re not sensitive to its active ingredients. Moreover, start off by applying it only once a day to be super safe. If it goes well, start using it as per directions. (iii) It is a silicone-based product. This means it will not work well when used in conjunction with water-based moisturizers. Suitable for: All skin types, but more geared towards dry and sensitive skins. Active Ingredients: Titanium dioxide (2%), Zinc Oxide (17%). (i) Generously apply all over your face 15 minutes before exposure to the sun. (ii) In case of swimming or excessive sweating, reapply after 40 minutes. Otherwise, you will only need to reapply it after every 2 hours. This metrifying 100% physical sunscreen is formulated with titanium dioxide and zinc oxide (Z-Cote) to provide powerful level of broad spectrum UV protection against the sun’s harmful rays. With an SPF level of 50, it provides oil-absorbing protective base with a matte finish, while not feeling heavy on the skin. (i) 100% physical broad spectrum UVA/UVB protection, leaving with a matte finish and a nice little universal tint to all skin tones. (ii) It’s non-comedogenic, which makes it a great choice for people with acne-prone skin. (iii) Evens out your skin texture while minimizing appearance of your large pores. (iv) Weightless mousse dries to a powder finish, leaving no greasy feeling behind and optimizing make-up application. (v) Enhanced with aerated silica technology, it can deal with even hot, humid conditions. (vi) Helps to repair skin using a combination of various ingredients, many of them being natural. Ideal if you are in the midst of recovering from acne. (i) Some users complain about this sunscreen’s tint. (ii) Some complain about its lack of waterproof capabilities, which means you’ll have to reapply it every two hours or so. Active ingredient: Numerous, although this is one of the only a few products on market to contain zinc oxide. Suitable for: All skin types and tones. (i) Apply 15-20 minutes before sun exposure. (ii) This non-comedogenic sunscreen from Skinceuticals is quite thin. So, you might need to apply a double coat for ultimate protection (first, check results with a single coat). Specifically meant for people who suffer from acne and have sensitive skin. Formulated with only high quality natural minerals, 10% Zinc Oxide and 5 % Titanium Dioxide, for broad spectrum UVA and UVB skin protection. (i) Dermatologist-recommended, it offers a powerful protection from the sun’s harmful rays, yet it’s gentle enough even for very sensitive skin. (ii) Soothes redness and burning. (iii) Doesn’t contain any chemicals, fragrances, and parabens. (iv) Another great thing about this sunscreen is that it has patented BPA-free plastic cap on its 3.0 oz tubes, which is UV photosensitive. It’s designed to detect harmful UV rays and change color to remind you to cover up. The deeper blue the cap becomes, the more UV rays are currently present. (i) Some users complain that this sunscreen is difficult to absorb into the skin. (ii) Some complain that it leaves a white cast after application. Shake well prior to use. Apply liberally to dry skin 15 minutes before sun exposure. A high-performance multitasking sunscreen, 100% Safe. Loaded with antioxidants vitamin C, D, E, Aloe Vera & Cucumber. Aloe Vera and Cucumber soothes and heals the skin, whilst Vitamin C, Vitamin D & Vitamin E protect against free radicals to prevent wrinkles, brown spots, and freckles for younger looking skin. Glides on evenly, absorbs quickly and leaves a sheer, lightweight, non-greasy finish. This sunscreen is not just about protecting your skin from the harmful rays of the sun, although it does that pretty well. Instead, the Rejuvelle sunscreen for the face is a combination product. It acts as a moisturizer too. (i) Best choice if you’re after a more natural product. Enriched with Vitamins C, D & E Aloe & Cucumber. PABA free, which makes it safe for the whole family. Great for sensitive skin & acne prone skin. (ii) Anti-aging, 100% natural UVA/UVB moisturizer, SPF 45 Broad Spectrum Zinc Oxide sunscreen. Water Resistant – 40 minutes. (iii) Acts as Sunscreen and day moisturizer, but is non-greasy at the same time. Sheer lightweight and non-greasy. (iv) Enriched with antioxidants that can help repair your skin after a bad bout of acne. (v) You can use it daily alone or under makeup. (vi) Contains no artificial ingredients, sulfates, dyes and is PABA free, non-comedogenic (won’t clog pores), non-whitening. Contains octyl methoxycinnamate, which doesn’t suite everyone and can lead to adverse side effects. So, it’s better to check whether or not you’re sensitive towards this ingredient. Suitable for: All skin types. Specially formulated for sensitive, acne prone skin. Can be used by men, women, and children over 6 months. Active ingredient: 12% Micronized Zinc Oxide. Apply 15 minutes before sun exposure. Reapply: after 40 minutes of swimming or sweating, immediately after towel drying. 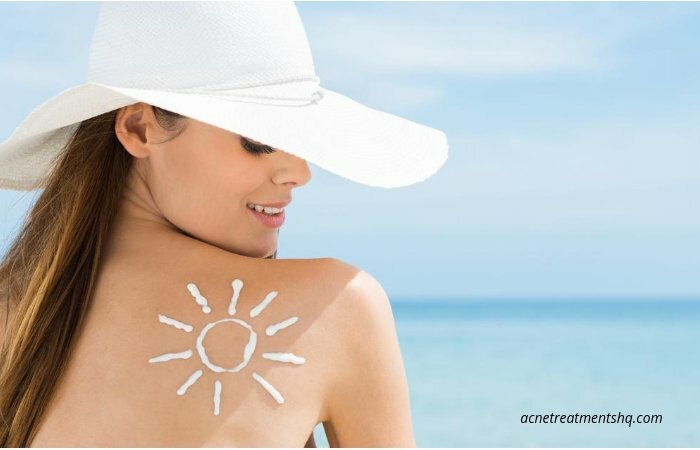 A broad-spectrum uniquely designed sunscreen, containing to protect your skin from UVA/UVB rays and help in maintaining your skin younger looking. Designed to be used in conjunction with other products in the Obagi Nu-Derm System, which helps transform the skin’s appearance by brightening the complexion, revealing younger, healthier-looking skin. But you can certainly use it on its own. (i) Especially formulated to help in dealing with acne. Improves skin texture. (ii) Shields your skin from harmful UVA/UVB rays. (iii) Deals with rough and dull skin. Reduces the signs of ageing and helps rejuvenate your skin. (iv) Effectively reduces and prevents the signs of inflammation. (v) Has a fresh cucumber-ish smell. Leaves your skin a bit oily immediately after application. But it sinks in after a while and keeps your skin moisturized. Active Ingredients: Octinoxate 7.5%, Zinc oxide 9%. Also contains natural ingredients such as aloe and cucumber. Apply evenly on your skin 15 minutes prior to sun exposure. Reapply after every 2 hours. This Supergoop! Everyday Sunscreen is perfect for those who want to preserve and protect their skin’s youthful glow. Infused with Cellular Response Technology, this SPF 50 broad-spectrum sunscreen helps to protect your skin from harmful sunrays. This every-day feel-good formula lotion is moisturizing, lightweight and fast-absorbing, which also repair your skin over time. (i) SPF-50 oil-free, face and body moisturizing lotion protects your skin from sun’s rays, defending skin from photo aging and dehydration. (ii) Contains vitamins and antioxidants that help repair and rejuvenate your skin. (iii) Oil free, non-comedogenic (won’t clog your pores), kid-friendly and water-resistant. (iv) Parabens free, which means it is suitable for those with sensitive skin. (i) It has a strong smell. You may not like it, if you prefer fragrance-free products. (ii) It’s super thin and gets promptly absorbed. So, don’t be surprised if you run out of it too soon. Suitable for: All skin types, particularly sensitive skin. (i) Apply liberally to your face and body 15 minutes before going outside. (ii) Though it can be your good partner at a day in pool, beach, or a resort, it’s best to use a water resistant sunscreen in these cases. Using a sunscreen doesn’t mean that you neglect other basic sun-protection measures such as avoiding sun exposure as much as you can (especially between 10 AM to 2 PM), seeking shade, and wearing long sleeved shirts, pants, hats and sunglasses. (i) To help prevent skin cancer, apply generous amounts of SPF 15 (or higher) sunscreen for your daily protection. Reapply often during outdoor activities, especially after swimming, perspiring, or using a towel. (ii) Cover up before you go out. If you need to be outside for an extended period, consider wearing protective clothing such as wide-brimmed hats, sunglasses, long sleeves, and long pants. These will protect your skin from sun damage. (iii) Try to find a shade wherever possible. (iv) For vitamin D, the sun is not the only source (although UV radiation is one source of vitamin D, but UV exposure also increases the risk of skin cancer). Consider getting vitamin D safely through a healthy diet of vitamin supplements. (v) Remember no tanning bed is ‘safe.’ Using tanning beds may increase the risk of some forms of skin cancer. (vi) Most important is pick the right sunscreen. I know finding the perfect SPF for your skin can be a daunting task. That’s why I have made the above ultimate list of top sunscreens for acne prone skin. Now you only need to try out a few products from the above list to figure which one works best for you. Let me know which sunscreen you are using in the comments below.